Happy nuke year, everyone! Man, the Trump administration's recklessness really makes people feel like they can just say whatever they want with no consequences. Apparently, Donald Trump's penchant for reckless tweets is contagious, and has spread to United States Strategic Command (USSTRATCOM), which is part of the Department of Defense. “#TimesSquare tradition rings in the #NewYear by dropping the big ball...if ever needed, we are #ready to drop something much, much bigger,” tweeted US Strategic Command. Watch the funny video. It's hilarious. #TimesSquare tradition rings in the #NewYear by dropping the big ball...if ever needed, we are #ready to drop something much, much bigger. The military men who have the power to launch nuclear weapons at the command of a Potemkin President's tweeted impulse are making jokes about dropping nukes for New Year's, just because they can. I'm sure Putin thinks it's all hilarious. 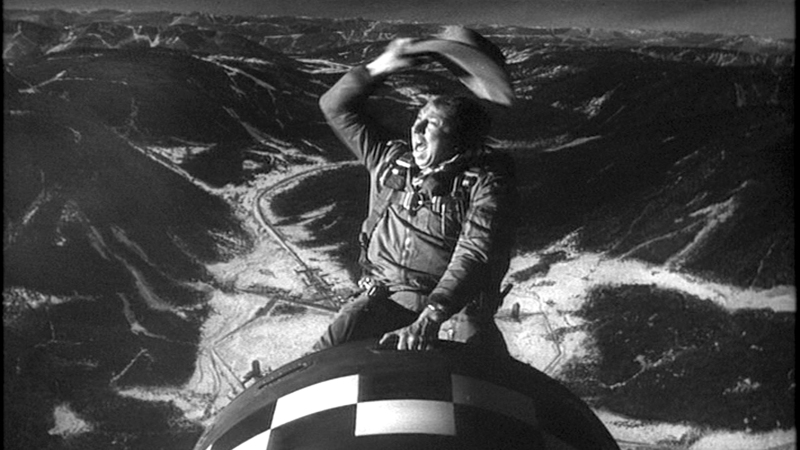 PHOTO, TOP: Slim Pickens rides the bomb in Stanley Kubrick's classic film, Dr. Strangelove, Or: How I Learned to Stop Worrying and Love the Bomb.